Adonal David Foyle (born March 9, 1975) is a Vincentian-American retired professional basketball center. He was selected by the Golden State Warriors with the eighth overall selection of the 1997 NBA Draft. He played ten seasons with the team until the team bought out his contract on August 13, 2007. At the time, he had been the Warriors' longest-tenured player. He then played two seasons with the Orlando Magic and part of the 2008–09 season with the Memphis Grizzlies, sat out the next season due to knee surgery, and retired. As of 2018[update], Foyle does Warriors post game commentary for ABC 7 in San Francisco. Foyle was born in Canouan, St. Vincent and the Grenadines. At the age of 15, Foyle was adopted by Joan and Jay Mandle, professors at Colgate University. He first attended high school at Cardinal O'Hara Catholic High in Springfield, Pennsylvania. He transferred after sophomore year and attended high school at Hamilton Central School (Hamilton, New York), where he helped the HCS Emerald Knights gain their first two state championships. As of 2016[update], his 47 points and 25 rebounds in the NYSPHSAA Class D semifinals in 1994 are tied for the most in either statistical category in a state tournament game. In his official biography, Foyle explained that he enrolled at Colgate University because "he wanted the opportunity to learn the principles of the game in a slower paced setting, where the coach would be able to give him the attention he desired." With the Colgate Raiders, he was the school's all-time leading rebounder and 2nd all-time leading scorer. He led the Raiders to their first two NCAA Tournament appearances in school history. He left as the NCAA's all-time leader in blocked shots with 492, despite playing only three college seasons (his record was broken by Wojciech Myrda in 2002). He now ranks third all-time, behind Myrda and Jarvis Varnado. In his NBA career, Foyle averaged 4.1 points and 1.6 blocks per game. He was among the top-10 in blocks per game three times during his career. In July 2004, during the offseason, the Golden State Warriors re-signed Foyle to a six-year, $42 million contract. Foyle played sparingly during the 2006–07 season under head coach Don Nelson, and was waived by the Warriors on August 13, 2007, with three years and $29.2 million remaining on his contract. On March 1, 2009 the Grizzlies waived Foyle. He signed with the Orlando Magic on March 23, 2009 for the rest of the season. Later that year, in August, Foyle re-signed with the Magic. However, he underwent arthroscopic knee surgery before the season began, and did not play that season. On August 17, 2010, Foyle announced his retirement. On September 7, 2010, the Magic named Foyle the team's director of player development, which he held until 2012. In 2005, Foyle founded the Kerosene Lamp Foundation, which serves children in St. Vincent & the Grenadines. He played a cameo role of "detective" in the 2006 movie The Darwin Awards. He was elected to the Common Cause National Governing Board in 2008. On September 24, 2009, Foyle was inducted into the World Sports Humanitarian Hall of Fame. Only eight other NBA players have been inducted into the World Sports Humanitarian Hall of Fame (Nate "Tiny" Archibald, Vlade Divac, Julius Erving, AC Green, Kevin Johnson, Dikembe Mutombo, David Robinson and Steve Smith). In January 2014, Foyle traveled to Spain and Morocco as a SportsUnited Sports Envoy for the U.S. Department of State. In this function, he worked with Ruth Riley to conduct basketball clinics for more than 600 youth from under-served areas. In so doing, Foyle helped contribute to SportsUnited's mission to promote conflict resolution, leadership, greater understanding and inclusion through sport. The Golden State Warriors appointed Foyle as the team's community ambassador in 2014. ^ a b Citizen Foyle: a New Status for Center Archived July 23, 2008, at the Wayback Machine, March 12, 2007. ^ "Bio". Archived from the original on September 27, 2002. ^ "NYSPHSAA > Sports > Basketball (Boys) > Record Books". www.nysphsaa.org. New York State Public High School Athletic Association. Retrieved November 3, 2016. ^ "MSU happy to welcome back Varnado". ESPN. May 12, 2009. Archived from the original on May 19, 2009. Retrieved June 4, 2018. ^ "Bio: College". AdonalFoyle.com. Archived from the original on July 24, 2011. Retrieved August 17, 2011. ^ "Grizzlies acquire 2009 first round pick from Magic". NBA. February 19, 2009. Archived from the original on February 23, 2009. Retrieved February 20, 2009. ^ "Grizzlies waive center Adonal Foyle". NBA. March 1, 2009. Retrieved August 29, 2009. ^ "Magic Re-Sign Adonal Foyle". NBA. March 23, 2009. Retrieved August 29, 2009. ^ "Magic Re-Sign Adonal Foyle". NBA. August 27, 2009. Retrieved August 29, 2009. ^ Josh Robbins. 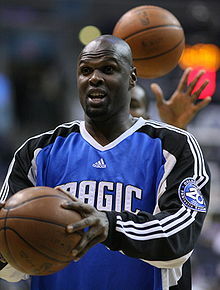 "Magic fire Director of Player Development Adonal Foyle". Orlando Sentinel. June 25, 2012. Retrieved on June 25, 2012. ^ "Bio • College". AdonalFoyle.com. Archived from the original on September 27, 2002. ^ "Adonal Foyle Becomes U.S. Citizen". Archived from the original on August 24, 2010. ^ "World Sports Humanitarian Hall of Fame to Induct NBA's Adonal Foyle, MLS great Diego Gutierrez, US hurdler Tracy Mattes" (PDF). Archived from the original (PDF) on March 29, 2012. ^ "Former Warriors Player Adonal Foyle Releases Children's Book". NBC Bay Area. Retrieved June 4, 2018. ^ "NBA players participate in youth basketball training program across Morocco". Morocco World News. January 22, 2014. Retrieved May 1, 2016. ^ "Ajuntament de Sant Feliu de Llobregat". www.santfeliu.cat. Retrieved May 1, 2016. ^ "Warriors Name Adonal Foyle Community Ambassador | Golden State Warriors". Golden State Warriors. Retrieved May 26, 2018.